Salamander Energy has announced that the West Kerendan-1 (WK-1) exploration well has reached total depth and has successfully tested gas from the Upper Berai reservoir and will be potentially completed as a future producing well following completion of the testing programme. Following wireline logging, pressure and sampling programmes, Salamander can confirm that gas has been encountered in four zones: Middle Miocene sandstones, Oligocene Upper Berai and Lower Berai formation carbonates and the Eocene Tanjung formation sandstones. As announced on 9th December 2013 the top of the Upper Berai carbonate formation was encountered at 2,514 m true vertical depth sub-sea ('TVDSS'), 110 metres high to prognosis with gas ingress to the well bore. A full suite of wireline logs and pressure surveys has been acquired which has confirmed that the Upper Berai in the WK-1 location is gas-bearing, with approx. 119 m of net pay being penetrated in a gross column of up to 421 m. Pressure sampling has confirmed that the majority of this gas column has the same pressure regime as the Kerendan field, some 10 km east of the WK-1 location and shares the same gas-water contact. The Upper Berai also contains a second separate, deeper gas column with a separate gas-water contact inferred from pressure data to be some 84 m deeper than the Kerendan field at a depth of 2,940 m TVDSS. A cased hole drill stem test ('DST') has successfully flowed gas at a maximum rate of 18.6 mmcfgpd and 181 bopd from a 70 m interval in the deeper Upper Berai zone. A further DST will be performed across a 200 m gross section to establish production rates in the upper interval and the overall productivity of the entire Upper Berai section. Within the upper gas column, the West Kerendan discovery has been independently certified by Salamander’s reserves auditor to contain recoverable gas in the range 133 Bcf – 682 Bcf with a mid-case assessment of 313 Bcf. This is in addition to the certified resource of 280 Bcf in the Salamander-operated Kerendan field currently under development. Above & beyond these resources, management estimate an additional 50 Bcf of recoverable gas to be available from the lower gas column, which has been successfully tested. Following the successful test in the Upper Berai formation, Salamander will open discussions with the Indonesian authorities with a view to including the West Kerendan discovery in the Kerendan field plan of development. This enlarged field development would then form the source of incremental gas sales to the gas-fired power plant that is currently being constructed adjacent to the Kerendan field. The secondary target Lower Berai Formation carbonates were encountered at 2,915 metres TVDSS, some 53 m high to prognosis. Wireline logging and drilling gas shows indicated the occurrence of up to 70 m net pay across multiple thin pay zones. Volumes attributable to this interval are still being evaluated. The WK-1 well penetrated 250 m of Eocene Tanjung formation overlying Basement. 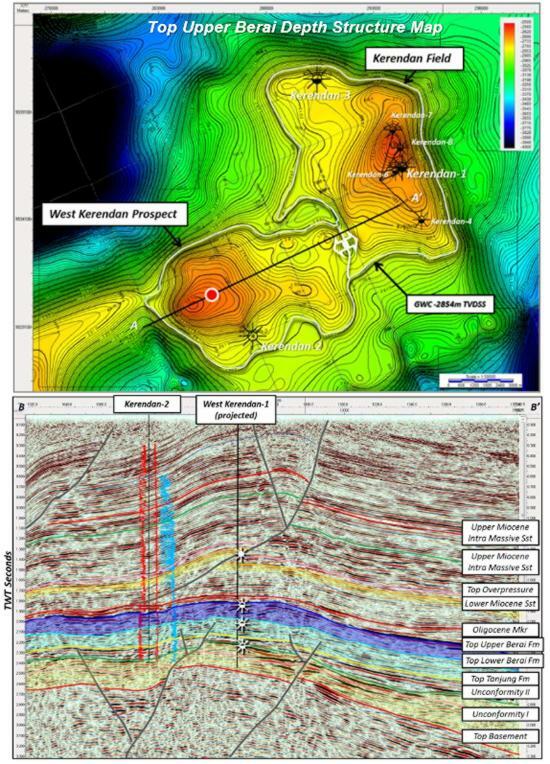 Drilling gas shows and wireline log evaluation indicates 8 m of net gas-bearing sandstones across a 45 m thick interval near the base of the sequence. The Tanjung section is interpreted to represent a thin cover to a long-standing basement high and as part of the overall appraisal of the West Kerendan area, Salamander will target the testing of thicker developments of Tanjung sandstone sequences down-dip of the structural crest. The West Kerendan-1 exploration well (WK-1), which lies within the Bangkanai PSC, in Central Kalimantan, Indonesia. Salamander has a 70% operated interest in the WK-1 well.